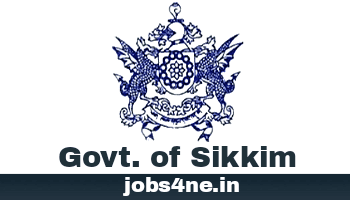 Sikkim PSC Recruitment 2017- 100 Nos. Lower Divisional Clerk (LDC) Vacancies: Last Date 31-07-2017. - Jobs4NE : Jobs in Assam and North East India. Sikkim PSC Recruitment 2017- 100 Nos. Lower Divisional Clerk (LDC) Vacancies: Last Date 31-07-2017. Applications are invited from the eligible local Female candidates for filling up of 100 (Hundred) posts of Lower Divisional Clerk (LDC) on temporary regular basis in the Sikkim Sub-Ordinate (Ministerial & Executive) Service under DoPART, through Direct Recruitment. However, during the period of Probation/ Apprenticeship/ Training, pay shall be governed by Notification No: 489/GEN/DOP dated: 31.10.2011. Last date of receiving of application: 31-07-2017. Name of the post: Lower Divisional Clerk. Total no. of post: 100 Nos. Educational Qualification: Class XII examination passed from recognized Board with at least 03 (three) months basic course in Computer applications. Age Limit: Should have attained the age of 18 years, but should not have exceeded 30 years as on 31.05.2017. The maximum age limit is relaxable by 05 years in case of SC/ ST/ BL/ PT candidates, 04 years for OBC (Central List) candidates; 03 years for OBC (State List) candidates vide Notification No. M(135)/12/GEN/DOP dated: 27th May, 2015. The upper age limit shall further be relaxed by ten (10) years for persons with Disability in terms of O.M. No. 1632/GEN/DOP, dated: 27.02.2008. Scale of pay: PB-1, Rs. 5200- 20200/- + Grade Pay Rs. 2600/-. How to Apply: The complete filled in application form available in the website http://www.spscskm.gov.in along with copies of all essential documents/ testimonials should reach the Secretary, Sikkim Public Service Commission, Old Tourism Office, M. G. Marg, Gangtok by hand or by post on or before last date.